This is a copy of the Final Exam that was submitted in keeping with my Crystal Healing Practitioner course in December 2006 whereby I had to write at least 1000 words on how I would use Crystal Healing either in my own life or on a person that I would treat. The therapeutic use of gems is not a new or alternative healing method. Evidence that gemstones were used to heal disease can be found from the most ancient civilizations. Whether in leather pouches as carried by the Sumerians, or worn as talismans and amulets, or distilled into powders or elixirs, gemstones were known by natural healers to strengthen those who wore them, protecting from evil spirits, sickness and disaster. In the Vedic tradition, naturopathic medicine was known as Ayurveda, a word that is derived from sanskrit with “ayur” meaning life and “veda” meaning wisdom. Ayurveda describes in detail how to prepare elixirs, pastes and powders made from gemstones. In the first Chinese medical book, written 5000 years ago by Shen Nung, the Red Emperor, can be found detailed descriptions of gemstones and their influence on the body. In answering this exam question, I can only concentrate on what it is that I am doing, on what it is my intent to do, with regards to crystal healing in my personal life. In the future, it is my dream to own/operate a wholistic wellness center as a means of sharing my knowledge with others. On a spiritual (esoteric) level, I find that I have a great affinity for the mineral kingdom. I believe that one of the ways I can develop open-mindedness and intuition is through working with crystals and gemstones. Crystals, when they come into your possession, can still be holding programs that allow them to work with discordant energies. Deprogramming stops the crystals from doing this. There is a difference between programming and cleaning or cleansing. Programming imprints a command, or a thought form or idea, into the internal matrix of the crystal, just as you would put the information onto the hard disk of a computer. Clearing and cleansing merely clears the crystal of the accumulation of unwanted energies. Despite the fact that the most commonly given method of deprogramming and cleansing one’s crystal is to put them in sea salt or saline solutions, I chose specifically NOT to use this method for the simple reason that salt is a crystalline structure. Salt is also a great gatherer of discordant energies, or energies that have disassociated themselves from the Source, or from the Light. Crystals do not like salt because it gets into the microscopic cracks in the faces of the crystal and leeches out their water content. They dehydrate and start to crack. It is possible to actually deprogram and reprogram the salt in order to clear it of unwanted energies, but even so the crystals still do not like being in salt, because of the dehydration that it causes. I clear and cleanse my crystals, before using, with INTENT. Thought is energy, and intent is everything. When you draw a symbol in your mind, or with your hands, or repeat the name of a symbol, then you link, or connect with, the energy of that symbol. This is linked with intent. I make use of my Reiki 2 symbols, first connect by invoking the Choku Rei symbol followed by the Sei Hei Ki (to clear of accumulated energies). I then follow with the Choku Rei again, repeating twice more, saying each symbol in a series of 3’s. There exists a popular trend towards “programming” a crystal to fulfill a specific purpose. I, myself, am most uncomfortable with this practice, having wondered if such might actually have an adverse effect on the crystal, myself and anyone upon whom the stone might be used, for it is in programming a crystal that one attempts to exert their will on the deva (a situation that can only be described as a form of slavery upon the free spirit of the crystal). One merely has to stop for a moment to consider if they would wish to be treated in such a manner. To my way of thinking, there is no way to determine ahead of time what kind of negative effect the stone would generate if used for healing purposes. However, there is no doubt that in acting contrary to the rule of HARM NONE, there would be one. It is an illusion to think that you can work effectively with crystals if you have not already started to work on yourself (p 17). The crystal is but a tool, for it is not the crystal which will do the work but the person who holds it and who channels their will to heal into it (p 18). I believe, as does Luc, that crystals are living beings, an intimate part of Mother Earth. In this light, everything that we think, say and do is registered, expressed and amplified by the crystals. If you possess a power such as that of working with crystals, you have also the responsibility for it. With any power there comes responsibility (p 24). Just as there are different categories associated with gemstones, so, too, are there different uses associated with each. ROUGH stones (allowed to remain in their natural condition), understandably, are said to possess the greatest healing power and should be placed directly upon the body. TUMBLED stones are more gentle and calming in nature, often used as touchstones, are best suited for a number of purposes; namely, to be laid or pressed into the body;holding them; rubbing them; placing them directly under one’s pillow; worn over clothing. PRECIOUS and SEMI-PRECIOUS stones are most often crafted into jewelry. The metals in which these stones are set can increase their energy level. There are many different methods of utilizing the powers of individual crystals, as indicated above, for healing purposes. • I enjoy placing crystals within my environment to (a) soak up electromagnetic pollution (related to computer, microwave, mobile phone, and television) and to (b) bring peace and harmony to an area. Crystals have the property of trying to instill order into whatever place they are put, so handling or being surrounded by crystals will always have a beneficial effect. In my attempt to oxygenate the air in a stagnant room, I will also place numerous crystal clusters about the area. • I have begun meditating with stones resting on my body in the belief that my awareness will connect with the attributes of the stone, thereby inviting the crystal devas (spirits) into my life. • In addition to wearing crystal jewelry, I carry crystals and stones around with me (inside my deerskin medicine pouch), believing that I can draw upon their energies and attributes as needed. When making a final selection, I focus primarily on the key metaphysical properties attributed with each. • I enjoy meditating within a crystal field (placing crystals around my body). I place agate slices (because agate is a very protective stone) in a circle, seating myself inside. • I make use of my chakra disks (imported from the UK) to help clear my chakras. In a healthy body, each of these energy vortexes revolves at great speed, permitting vital life energy to flow upward. When energy is blocked in a specific chakra, symptoms develop in the associated organ or bodily system. The quickest way to regain youth, health and vitality is to assist these energy centers in spinning normally. One of the simplest ways to help balance the whole chakra system is to place a stone of the appropriate colour on each area of the body. It is also a good idea to place a grounding stone between the feet to act as an anchor. By comparison, one may simply wish to visualize colour in the area of the chakra while holding specific stones and listening to chakra clearing meditations. 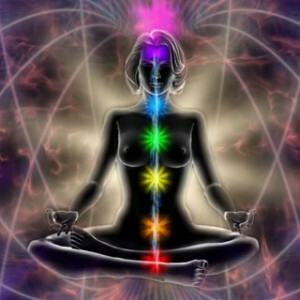 As the chakras open, one gains better health, emotional balance and vitality. In addition to the seven basic chakras, there are three major energy flow points that healers can avail of. They are (a) the Soul Star (located above the Crown Chakra), (b) the Earth Star (located below the feet and within the Earth, and (c) the Kundalini, which connects the Base Chakra to the base of the brain. I have also come across additional interchangeable terms; namely, Transpersonal Chakra for Soul Star and Earth Chakra for Earth Star. The function of the Soul Star is to connect our energies with the potent forces of the Universe. The function of the Earth Star is to connect our energies with Mother Earth in order to bring us to a greater understanding of the planet. The function of the Kundalini is to connect our sexual/life force energy to our brain, thereby enabling us to think as well as to act. As there are specific colors associated with the seven basic chakras, so, too, are there colors associated with these energy flow points. Blockages cause dis-ease which, then, causes most of our physical problems; hence, they must be removed. Crystals can help greatly in this regard. It is important to realize that certain crystals also serve to balance the Yin and Yang energy meridians in the body. Malfunction, tension, disease and infection can result from an imbalance in the energy distribution along the meridian system. Given that vital energy (chi) flows via the meridian system from one organ to another, it must flow freely in order to maintain and promote optimum physical functioning and good health. An imbalance in a specific meridian does not necessarily mean that there is something wrong with the organ associated with that meridian. Rather, it implies that there is either too much or too little energy along that meridian. One’s first duty is to make the body healthy. I aim to begin using crystals to structure water. Earlier cultures understood water much better than we do today. The ancient Chinese saved water in Jade vases. The Incas and Aztecs saved water in Obsidian jars. African witchdoctors used Quartz. Pure water was treasured. Water can be de-structured not only by the addition of harmful chemicals but also by way of transportation through pressurized pipes, forcing it to move in an artificial way instead of its natural spirals. As water moves through pipes it forces the outer electrons to be removed, creating “unstructured” water. This means that all water that we drink or bathe in (that comes from pressurized pipes) is associated with disease. Water is much more than hydrogen and oxygen, it is the lifeblood of Mother Earth. It is a mysterious, crystalline living entity which nurtures all life. It is a powerful carrier, mediator and producer of energy. It has the ability to link, transform and carry physical elements and subtle energies. Flower and gem elixirs are a good example of the latter. Over 70% of our bodies and the planet is water. Healthy, structured water, therefore, becomes a necessity that cannot be exaggerated. In my research, I have come across a simple and inexpensive way to safely and effectively structure water. Steps 5 and 6 are not essential as quartz crystals will begin structuring the water anyway; however, it does amplify the process. Leave this arrangement where it will be undisturbed for several hours or overnight. If you are leaving it outside, cover with a plain glass sheet to prevent contamination. Drink the water every day. It is also important to make fresh “structured” water on a daily basis as research has shown that even naturally structured spring water loses its energy when placed in sealed containers for over 4 hours. • When conducting Reiki treatments, I strap crystals to my wrists (placing them inside athletic bands) with the points facing downwards. Using one on each wrist, of about the same size, will amplify the universal healing energy (Unconditional Love) that flows during the healing session. It is my intention to continue to combine these two healing modalities in other intuitive ways. • There are a multitude of crystal layouts that I am able to avail of for balancing and calming, alleviating stress and tension, centering and grounding my energies, soothing headaches, easing PMT and menstrual cramps, relieving aches and pains and energizing my body. • As a means of energizing, cleaning and clearing one’s aura and meridians, I often lie on my bed with clear crystal points facing inwards for about 10 minutes. It is then followed up by reversing the crystals, so that their points are now facing outwards. This draws off all unwanted energies, lowers high temperatures, draws away any inflammation. I remain in this position for about 10 minutes. The session is completed by turning the crystals inward, once again, thereby re-energizing and balancing my body once more. • Many people say that dowsing is difficult, and that it requires certain gifts or skills in order to be a dowser, but it is actually the easiest thing in the world. We are all human tuning forks, receiving and transmitting a myriad of energies and frequencies continuously, and the reply to your questions in dowsing will come through your I AM presence (also referred to as your Higher Self). I make use of several pendulums. In asking questions, one must be as clear and precise ss possible. Just formulate the thought in your mind, with intention, and allow the impressions to flow through you, holding the pendulum with an impartial mind. Ask the question, and then empty your mind, and take the answer that you get. If you think that you have not received an accurate answer, then you can always reconfirm it again by slightly re-wording your question. One can ask questions about choosing crystals and identifying blocked chakras. In summary, in order to fully appreciate the value of working with crystals in healing, it is important to recognize that the human body is basically crystalline in nature (water and blood are both forms of liquid crystal). The blood, for example, with the help of intention, could be re-programmed to become living crystal light, carried to every part and cell of the body, encoded with the energies of the seed blueprint of creation in accordance with Divine Will (utilizing only energies that are of the Light) for one’s evolution in this lifetime. Clearly, crystals can aid in the healing to reprogram our minds as well as the consciousness of our cellular structure. When you stop to consider the implications of this, it opens up a whole new avenue of possibilities. If I may, once again, quote from Luc Bourgault … If you possess a power such as that of working with crystals, you have also the responsibility for it. With any power there comes responsibility (THE AMERICAN INDIAN SECRETS OF CRYSTAL HEALING, p 24). Something we all must strive, daily, to remember.